Ryu, Dongseok; Um, dugan; Cho, Ilje "Comparative Performance Evaluation of Input Devices and T-less based on Steering Law in 2D Tasks", Submitted to IEEE Transactions on Human-Machine Systems, 2015. Dugan Um, �Multiple Intensity Differentiation based 3D Surface Reconstruction with Photometric Stereo Compensation,� IEEE Sensors Journal (Impact Factor: 2.048), 2014. Um D., Ryu, D., "SPAM for a Manipulator by Best Next Move in Unknown Environments," ISRN Robotics, vol. 2013, Article ID 679784, 8 pages, 2013. Young Sam Ryu, Do Hyong Kohu, Dongseok Ryu, Dugan Um, �Usability Evaluation of Touchless Mouse Based on Infrared Proximity Sensing,� Journal of Usability study,� Vol. 7, Issue 1, November 2011, pp. 31-39 , 2011. Dugan Um, Dongsuk Ryu, MyungJoon Kal, �Multiple Intensity Differentiation for 3D Surface Reconstruction with Mono-Vision Infrared Proximity Array Sensor,� IEEE Sensors Journal, vol. 11, no. 12, pp 3352-3358, Jun, 2011. Dugan Um, Dongseok Ryu, �A Framework for Unknown Environment Manipulator Motion Planning via Model Based Realtime Rehearsal,� Journal of automation, Mobile Robotics & Intelligent Systems, vol. 5, no. 1, 2011. William Stapleton, Bahram Asiabanpour, Jesus Jimenez, Dugan Um, �An REU experience with Micro Assembly Workcell research,� American Journal of Engineering Education, vol. 1, No. 1, 2010. D. Um, D. Ryu, B. Dong, D. Foor, K. Hawkins, �A novel flexible micro assembly system: implementation and performance analysis,� Journal of automation, Mobile Robotics & Intelligent Systems, vol. 4, no. 3, pp.10-15, July, 2010. Dugan Um, Bahram Asiabanpour, Jesus Jimenez, �A Flexible Micro Manufacturing System for Micro Parts Assembly via Micro Visual Sensing and EAP based Grasping,� Journal of Advanced Manufacturing System, vol. 8, No. 2, pp. 137-152, 2009. Dugan Um, �How to Tackle Sensor Based Manipulator Planning Problems Using Model Based Planners: Conversion and Implementation�, International Journal of Robotics and Automation, vol. 24, no. 2, pp. 137-146, 2009. D. Um, Lie Qui,� �Infrared Photometry for 2D Proximity Sensing and 3D Geometry Visualization,� Journal of Engineering and Technology, vol. 1, pp. 5-9, 2007. D. Um, V. Lumelsky, �Fault Tolerance via Analytic Redundancy for a Modularized Sensitive Skin''. Intern. Journal of Robotics and Automation. Vol. 15, No. 4, 2000. Um, Dugan ; Gutierrez, Marco A. ; Bustos, Pablo ; Kang, Sungchul, �Simultaneous planning and mapping (SPAM) for a manipulator by best next move in unknown environments,� 2013 IEEE/RSJ International Conference on Intelligent Robots and Systems (IROS), Tokyo, Japan, Nov., 2013. Dugan Um, Dongseok Ryu*, MYUNG JOON KAL, Sungchul Kang, �Short range 3D depth sensing via Multiple Intensity Differentiation,� IEEE International Conference on Robotics and Automation, St. Paul, MI, May, 2012. D. Ryu, D. Um, P. Tanofsky, H. Do, Y. Ryu, and S. Kang �T-less : a Novel Touchless Human-Machine Interface based on Infrared Proximity Sensing,� Proc. of IROS (IEEE/RSJ International Conference on Intelligent Robots and Systems), Taipei, Taiwan, 2010. Matthew Kurtz, Dave Foor, Mary Tellers, M. Todd McGregor, Bahram Asiabanpour, Dugan Um, "Microelectromechanical systems, Wet etch, EPW, boron doping,� MicroManufacturing Conference & Exhibits, Mesa AZ, April 14, 2010. Tellers, M., Kurtz, M., Foor, D., McGregor, M., Asiabanpour, B., Um, D, �Thin film silicon dioxide micro-scale parts release by Ethylenediamine-Pyrocatechol-Water solution,� Flexible Automation and Intellignet Manufacturing 20TH International Conference, California State University, East Bay, July 12-14, 2010. D. Um, B. Asiabanpour, D. Foor, M. Kurtz, M. Tellers, M. T. McGregor, �Micro Scale Silicon Dioxide Gear Fabrication by Bulk Micromachining process,� Proc. of IEEE International Conference on Nano/Micro Engineering and Molecular Systems, Xiamen, China, 2010. Dongseok Ryu, Bo Dong, Tim Davidson, Ammanda Burton, and Dugan Um, �Model-based Micro Profile Measurement using Multi-focused Images for Micro Gear Assembly ,� Proc. of IEEE International Conference on Nano/Micro Engineering and Molecular Systems, Xiamen, China, 2010. Dugan Um, �Development of a Micro/Nano Assembly Workcell Via Micro Visual Sensing,� Engineering Education NSF Awardees Conference, Reston, Virginia, Feb., 1-3, 2009. M. Todd McGregor, Hugo A. Mahlke, Sean M. Dozier, Bahram Asiabanpour, Dugan Um, �Producing micro scale silicon dioxide gears by bulk micro machining process,� Transactions of the NAMRI/SME, vol. 37, 2009. Diego Rojas Bandini, Dugan Um, �Underwater Robotics,� CAHSI Annual Conference, Mountain View, CA, Jan. 2009. D. Um, �Sensor Based Randomized Lattice Diffusion Planner for Unknown Environment Manipulation,� Proc. of IROS (IEEE/RSJ International Conference on Intelligent Robots and Systems), pp.5382-5387, Beijing China, 2006. D. Um and W.N.Hung, �A Novel Infrared Proximity Array Sensor for Micro-Workcell: Modeling and Applications,� Proc. 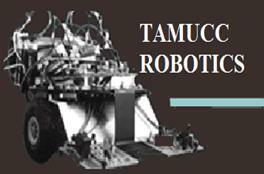 of IRAM (IEEE International Conference on robotics, Automation and Mechatronics), pp. 381-386, Bangkok Thailand, 2006. D. Um, �Introductory MEMS technology using Bulk Micromachining in the Semiconductor Manufacturing Technology Curriculum,� Proc. 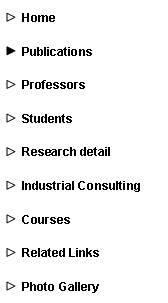 of American Society for Engineering Education, Chicago, 2006. D. Um,� V. Sriraman " Making Control Systems Theory Relevant to Manufacturing Engineering Students," International Manufacturing Engineering Education Conference, Cal Poly, San Luis Obispo, CA., 2005. B. Asiabanpour, D. Um, A. Tseng, J. Mata, N. Wahed, V. Sriraman, �Mobile Paving System (MPS): A new Large Scale Freeform Fabrication Method,� 16th Annual Solid Freeform Fabrication Symposium, Aug. 1, Austin, 2005. D. Um, H. Park, �Randomized Lattice Path Planning for Fast and Complete Search via Probabilistic Diffusion,� Proc. of IEEE Industrial Electronics, Mechatronics & Robotics, vol.2, pp.767-772, Aachen Germany, 2004. D. Um, S. Lloyd, �An affordable robotic guidance system in highly structured domestic environments utilizing AGV technology,� Proc. of IEEE Industrial Electronics, Mechatronics & Robotics, vol.1, pp.297-302, Aachen Germany, 2004. D. Um, V. Lumelsky �Fault Tolerance via Component Redundancy for a Modularized sensitive Skin� Proc. of IEEE International Conference on Robotics and Automation, vol.1, pp. 722 - 727. 1999, Detroit. D. Um, B. Stankovic, K. Giles, T. Hammond, V. Lumelsky �A Modularized Sensitive Skin for Motion Planning in Uncertain Environments� Proc. of IEEE International Conference on Robotics and Automation, vol. 1, pp. 7-12, Belgium, May 1998. D. Um "Local Step Planning for a Robot Arm Operating in an uncertain Environment " Proc. of SPIE (The International Society for Optical Engineering) International Symposium on Intelligent Systems and Advanced Manufacturing, 1998, Boston.